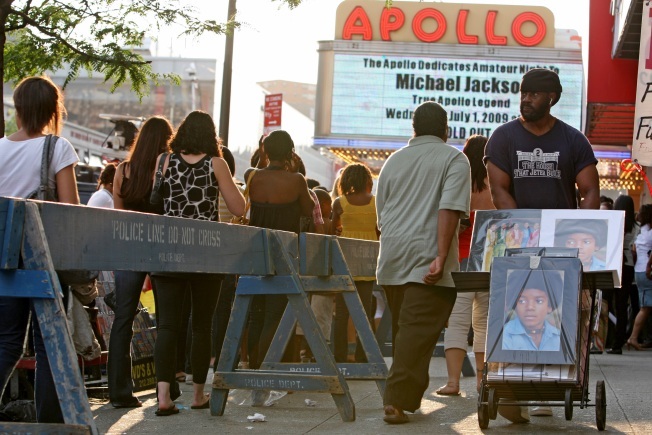 The Apollo Theater dedicated amateur night on July 1, 2009, to the king of pop, Michael Jackson. The King of Pop and Queen of Soul will be inducted into the Apollo Theater’s Legends Hall of Fame tonight during the historic theater’s Annual Spring Benefit Concert and Awards Ceremony. Academy award-winning actor Jamie Foxx will host the event, which will honor the late Michael Jackson and Aretha Franklin. Jackson unexpectedly died June 25, 2009. No one from the Jackson family will be attending, so Chris Tucker accept the award for the deceased singer, said a spokeswoman for the Apollo Theater Foundation, which is stages the benefit. Superstar couple Jennifer Lopez and Marc Anthony will also present the Ruby Dee & Ossie Davis Arts and Humanitarian Award. Angela Bassett and Danny Glover will make special appearances, and Sharon Jones, Estelle, Leslie Uggams, Donnie McClurkin, Marsha Ambrosius of Floetry and amateur night winner Clark King will perform. Tickets for the event, which begins at 7 p.m., run from $100 to $1,000. Organizers at the Apollo Theater Foundation said they expect to sell out for tonight’s event, and they estimate they’ll raise about $1 million for the famed venue on West 125th Street.